Pull up a chair and let me tell you about a primitive era in media history: the world of 2003. People who were unfortunate enough to live—if you can call it living—through this backwards time had no YouTube, no iPhone, no tweets, and very few blogs to choose from. In fact, "blog" or "Web log" was still written in quotes most of the time. Many Americans had internet access (54% of U.S. households), but if you were lucky enough to get it on your phone it looked pretty damn ugly. And the idea of your average person contributing to the national dialogue was pretty much out of the question. Dan Rather didn't mention his Twitter handle during the evening news broadcast. He didn't want to hear your opinion on his latest story. Why would he? There was no hashtag. There was no social media star. There was virtually no social media, for that matter. Citizen journalism looked much more like a letter to the local newspaper's editor or a podcast that nobody listened to than a Twitpic of a plane floating in the Hudson. An iPod was heavy enough to stun a charging rhino. So it's through this lens that we dust off an ancient book and transport ourselves to 2003, a time when the future of newspapers still looked like a proper newspaper, all big and unruly despite becoming digital. The 2003 book Catalog of Tomorrow looked at many predictions for the near future, including everything from Segways and flying cars to artificial organs and cyborgs. But it was the book's predictions for the future of media—the very same future that we're living in today—that somehow feels the most accurate while also remaining somewhat quaint. The video feed is grainy, bursting with occasional static and jerking with the vibrato of its holder's adrenaline-pumped muscles — but its contents are unmistakable. A major earthquake has just hit Seoul, South Korea, and the story is broken, as it unfolds, via the most technically sophisticated newsgathering platform every invented. A video-enabled, high-bandwidth cellphone — or, more specifically, thousands of such phones. In nearly real time, the feeds ping-pong through a network of global relays, spreading first-hand images of the quake across the globe. One such feed alights on a distant server, where it is piped to the community 'blog' (or Web log) or a distant friend (and continents) removed from its original author. Once posted, the feed inspires a frenzy of collective activity. One site member overlays the feed's GPS data onto a map of Seoul, pinpointing the quake's epicenter. Another runs the audio through an online auto-translator, while a third starts collecting other emerging accounts from a variety of professional and amateur sources. Their work ripples through the community — and is improved by it. Other members correct mistakes and improve on successes, as the group guides its own efforts. Without explicitly being told to do so, the group has amplified, clarified, and begun to contextualize the quake. News is born. Welcome to the not-too-distant world of journalism 3.0, the term Silicon Valley journalist Dan Gillmor coined for a world where the technology in your pocket can turn anyone into a news reporter. Where the collective efforts of a loosely joined group of amateurs can complement, and occasionally trump, the most powerful news media organizations. From its earliest days, the Web was seen as a new way to get the news out; it was initially lauded as a kind of hyper-efficient printing press. As the multimedia capabilities of the Web matured, news organizations began to see that the new medium expanded the possibilities of storytelling. Now, in the Web's adolescence, new dynamics are beginning to emerge. Individuals are empowered with ever more powerful multimedia devices. And new kinds of Web software are allowing regular folks to easily publish their own news stories and their interpretations of others' stories, and even to organize into their own novel forms of news organizations. This is participatory journalism on a grand scale, and it's eroding the traditional definitions and boundaries between journalists, events, and, in Gillmor's Terminology, "the former audience." Is journalism 3.o an upgrade worth making? It depends on whom you ask. Established news organizations would have to adapt to fit in with the new pace of news in all its forms. The "revolution" in the news business was going to be huge, but some of its consequences would be no doubt subtle. New technologies have had a complex, and often paradoxical, impact on the business and experience of the news, and the promise is to continually reshape it in the future. The spread of both digital recording devices and tools for online community participation have bolstered the notion of the Internet as a "People's Press" that provides a new role for the passionate amateur, while offering people a huge variety of opinions and perspectives. However, like any highly democratized media, the digital "idea commons" is a noisy and sometimes misleading place. Quality is extremely varied, and insights are often couched in political rants and questionable rhetoric. In response, news organizations are working on new ways to personalize the news and tell stories in ways that are both novel and compelling. There will be more subtle consequences of this revolution, though. No single news organization can compete with huge wired communities — they simply can't be in every place, every time. Thus, the rise of digital communities will shorten news cycles even further and may change the role of cable networks, much as their appearance transformed the role of newspapers. Perhaps the networks will cooperate, or further specialize. Perhaps they'll even put "bloggers" in their employ. And it's that last line that really pulls us back to 2003: "Perhaps they'll even put 'bloggers' in their employ." Imagine a news organization employing bloggers! What a crazy upside down world that would be. 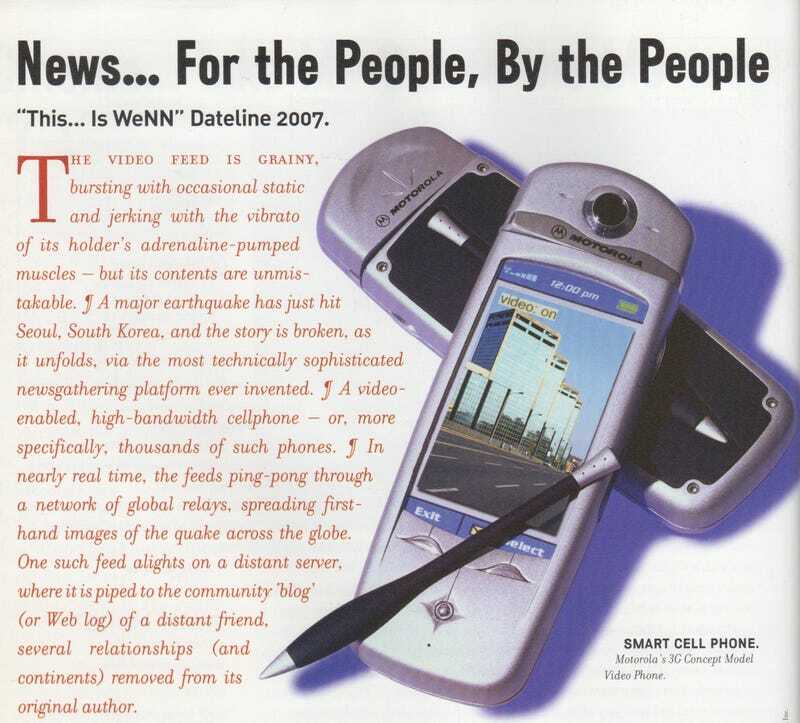 Futurist thinkers of the early 2000s understood that big changes were coming to the future of news. It was already happening. And while they may not have gotten all the specifics right (like which news sites would be popular by the 2010s) they certainly understood that it was a brave new world ahead of them. As the very people living in their media future, it's easy to argue that we're still trying to understand it ourselves.